The San Francisco Bay Trail turns 30 this year. The Metropolitan Transportation Commission (MTC) and a number of trail-side cities are celebrating with a photo exhibition, a new social media campaign and the unveilings of some exciting new sections of trail. The idea for the trail was first hatched in 1986 by Bill Lockyer, who was then a state senator from Hayward. As the story goes, Lockyer was having lunch at a waterfront restaurant with a journalist friend and said, “What if we tried to develop a pedestrian and bicycle path around the Bay, with access to the shoreline?” The friend loved the idea, and Lockyer immediately went to work rallying the support of fellow lawmakers to bring the idea to life. 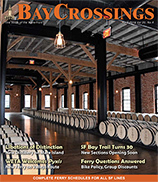 Nevertheless, Lockyer’s idea resulted in Senate Bill 100, which passed in 1987, calling for the Association of Bay Area Governments (ABAG) to create a Bay Trail Plan. The ensuing plan was approved in 1989, and Bay Area cities and agencies rolled up their sleeves and got to work. Three decades after ABAG set the trail’s wheels in motion, 356 of the 500 proposed miles are completed, and the trail is considered a vital public resource by Bay Area residents, many of whom will tell you they can’t imagine what life would be like without it. “It’s the Bay Area’s heart and soul,” said photographer Kurt Schwabe, whose breathtaking images of the Bay Trail are on display now through the end of September at MTC’s San Francisco headquarters. The opening of Schwabe’s Half-Light: A Study of the San Francisco Bay Trail exhibition last month officially kicked off the trail’s 30-year anniversary celebration. It was one day when he spotted a Bay Trail marker along a section of the path that Schwabe, whose day job is a marketing manager for an artificial intelligence company, decided to Google “Bay Trail” and learned of the effort underway to connect the cities ringing the Bay. It was that moment that he committed to walking the entire trail in thirty consecutive days and photographing his adventure. Those photos were posted on his blog and later exhibited. “I had been shooting photography seriously for about 15 years, so the idea to photograph and walk the trail was very spontaneous. It was both crazy and doable—perfect for someone like me.” For his second exhibition of Bay Trail images, Schwabe decided to shoot after sunset or an hour or two before sunrise, and to capture the calm of these moments with long exposures. It’s these kinds of personal connections with the Bay Trail that Thompson hopes to capture with MTC’s “30 on 30” campaign. Thompson said the work of completing the Bay Trail continues full-steam ahead. In fact, some new sections of the trail are scheduled to be opened as part of the celebration. Among them is a new pathway opening this summer that will connect Marin and Contra Costa Counties via the Richmond-San Rafael Bridge. Thompson said that’s a particularly important section, because the ability to cross Bay Area toll bridges on foot and on bike was a key part of the original vision for the trail. The trail currently crosses 4.5 bridges, the “.5” being the east span of the Bay Bridge.